Ever since its introduction into the automotive world in 1975, BMW’s 3 series vehicles have been popular cars, both in their home country of Germany and around the world. The BMW 323i is just one from this popular range that demonstrates why the 3 series is so well liked. Start up the 2.5 litre engine and run through all six gears, and you will find yourself flying from 0 to 100 km/h in 7.9 seconds (make that 8.8 seconds for the automatic version – a bit slower but still impressive). This rate of acceleration is accomplished by a maximum power of 140kW at 5900 rpm and a maximum torque of 230 Nm at 3250 rpm. The BMW 323i can sprint at a top speed of 233 km/h in the manual version, with the automatic version trailing just behind at 231 km/h. The manual version of the BMW 323i also comes out better than the automatic when fuel economy is considered, consuming only 6.2 litres/100 km on the open road and 12.1 litres/100 km in the city. The open road figure for the auto box is 6.5 litre/100 km; and the city driving figure is 12.8 litres/100 km. These are all average figures subject to review. Small differences they may be, but maybe there is a small price to be paid for the hassle-free convenience of the automatic transmission in terms of fuel economy, and the ability to get past slower drivers quickly and safely. BMW has had a long-standing tradition of safety, and the 323i keeps this tradition well and truly alive. The on-road stability and quick stopping ability of the BMW 323i is ensured thanks to DataDot technology alongside ABS, dynamic brake control, cornering brake control, automatic stability control plus traction and dynamic stability control. Passenger safety in the event of a crash is ensured by the driver and front airbags (these airbags have an occupant detector function), as well as the front side airbags, and the head airbag front and rear. BMW continues to shun the unsafe lap belt in the centre rear, fitting all five seats in the 323i with three-point seat belts and headrests. Park distance control at the rear also helps to prevent small dings when sliding the BMW 323i into a carpark. 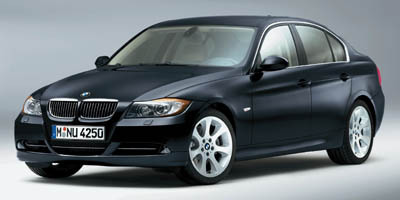 To look at, the latest styling of the BMW 323i is sleek and modern with a subtle hint of punchiness. The smoothly curving silhouette and lines manage to combine up-to-date aerodynamic features and still blend attractively with the distinctive BMW grille. All in all, it’s very easy on the eye. On the inside, even the entry-level BMW 323i is lusciously upholstered in Dakota leather. A range of trims are available, including titanium matt, burr walnut, brushed aluminium and natural poplar. And senses other than touch are gratified by the interior of the BMW 323i. Finding the perfect driving position is made easy by the retractable front armrest and partial electric seat adjustment for the front seats, which can be added to with the optional lumbar support. The CD/radio entertainment will provide pleasant background music to your drive (or stimulating discussion while you’re waiting at the lights). An onboard computer and preparation for a Bluetooth mobile are provided as technological bonuses as standard on the entry-level BMW 323i. BMW offers a wide range of options for the 323i that can raise its luxury levels a little higher, albeit at a price. The BMW 323i can be fitted with an M Sport package that includes 17″ double spoke alloy wheels, sports seats and sports suspension – and a special multifunction steering wheel. Exterior options include metallic paint, adaptive bi-Xenon headlights, high beam assist and an alarm system which should deter the yobbo who decides BMW stands for “Break My Windows”. On the inside, optional extras on offer range from heated seats and active steering to an 8.8″ colour monitor and professional navigation system which includes TV and voice recognition. The BMW 323i is a lovely all round car, neither too big nor too small, but still offering plenty of zip and creature comforts. For any more information on the BMW 323i, or for that matter any other new car, contact one of our friendly consultants on 1300 303 181. If you’d like some fleet discount pricing (yes even for private buyers! ), we can submit vehicle quote requests out to our national network of BMW dealers and come back with pricing within 24 hours. Private Fleet – car buying made easy!